Justus Madoya relishes a tussle with Richard Bollo in GOTY series. Luck came in handy for Great Rift club golfer Justus Madoya over the weekend when he won the Manchester Salver golf tournament, a Golfer of the Year (Goty) event in the Kenya Golf Union (KGU) calendar. 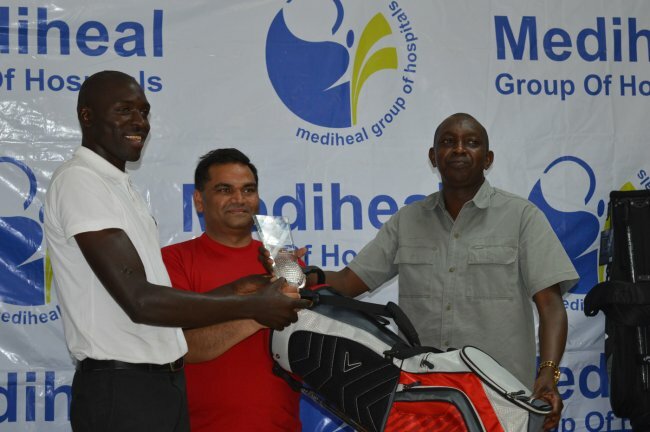 His unpredicted win came iwhen Madoya tied on five over 147 with Nandi Bears golfer and caddie at Eldoret Club Robert Kasi and David Sakwa, in the Mediheal-sponsored golf event forcing the KGU officials led by vice chairman Muchau Githuka, Andrew Chelogoi and club captain Joseph Watunu to determine how the winner to be decided by 'sudden death' playoff on holes 17 and 18. Sakwa failed on the first encounter with five strokes as Kasi and Madoya headed down to the wire but Kasi missed to putt, paving way for Modoya to win. The two-day event brought Madoya to cloud nine when he carded two rounds total of five over par, registering his second win in the Goty series at the par 71 Eldoret Golf course. He his win to the course saying the greens were running nicely as the course was playable. “Am happy to register my second win in the Goty event and I want to go ahead and win the overall title, I had a good birdie in the last hole,” Madoya explained. He added that in the whole series, he fears Royal Club’s Kennedy Bollo who he says is coming very fast. In round one played on Saturday, Madoya played five over 77 finishing in fourth position but he returned with a bang on the second day (Sunday) with one under 70 to tally his points to 221 ahead of East Africa challenge mid this month. Kasi, who is a caddie at the club, registered four over 75 on round one and one over 72 on return while Sakwa scored three over 74 and two over 73 on both plays. Immediate Eldoret Club golf captain Anand Lakhan was fourth overall with eleven over 152 after playing six over and four over 75 on both days respectively. Western Kenya KGU representative Andrew Chelogoi finished fifth overall after shooting twelve over 153 as K. Juma, Jeff Kubwa, Kenya’s number one Goty golfer John Karichu, Isaiah Otuke and Kennedy Bollo were top ten finishers.